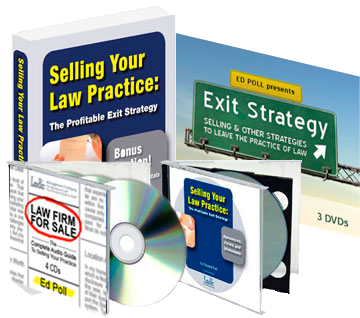 Ed Poll can help you successfully transfer the value of your practice through a sale, merger, retirement, or breakup, turning your years of effort in building client files and a reputable practice into real money. Thanks to changes in the American Bar Association's Rules of Professional Conduct in 1991, small firms, sole practitioners, and their heirs can now get paid for the goodwill of their practices. List your practice on the LawBiz® Registry site. We will list your practice here for a minimum of 6 months at the price $79/month. Let Us Help Sell Your Practice. Your law practice will be listed on the LawBiz® Registry web site, a site reviewed by many lawyers who are seeking to jumpstart and expand their current law practices. This may be the closest service to a multiple listing currently available. The listing will contain the contact information you choose to provide and all further information and contact shall be with you. Be sure to provide an enticing description of the practice; remember, you want people to get excited about your practice and call you directly for more information. Feel free to contact Ed Poll for more information or assistance in preparing the verbiage for your ad. 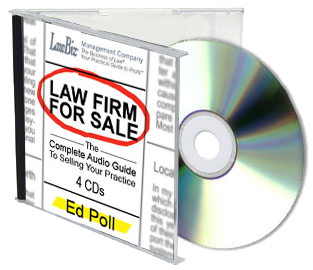 Ed Poll will work with you to help you prepare your practice for sale during a six-month coaching engagement. During this time, you and Ed will review the fundamentals of your practice and discuss where you should be focusing attention and resources in order to position your firm to get the most value during a future sale.